LARGER THAN LIFE: Free xbox along with kellogs!!! Have you ever opened a box of cerial and found a gaming console inside?? Not even in the wildest of ur dreams?? The unimaginable is going to happen. Microsoft is offering us the chance to play one of the three xbox mini games. These are small devices you may find in your Kellogg's cereal box and you'll be able to play either Disco Mania, Spaceship Blaster or Mystic Castle, if you're a fan of such arcade titles. This offer is currently available in Germany . None of the three titles above are deep or challenging. 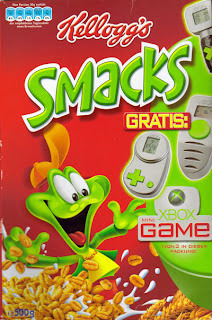 Microsoft and Kellogs have collaborated just to offer us some cheap gaming experience. Disco Mania, for example requires you to push d-pad buttons and imitate some dance patterns. Space Blaster requires you to dodge enemy ships and last, but not least, Mystic Castle will have you exploring a castle and collecting gems. Microsoft, some 2 years ago had ventured into similar promotional schemes when they launched Mountain dew- halo drink in the US. We can soon see nintendo taking a similar initiative by offering game consoles inside candy boxes as most of their market is composed of kids and females.